He was a real fighter. I really believed that one day he would make a recovery and his efforts would lead to millions of people being able to walk again and recover from spinal injuries. He really was a fighter. He showed such strength and heart. Very, very sad news. 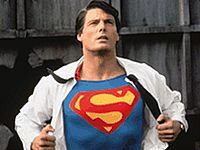 I think Reeves was a great human being and it's hard not to associate him with Superman. I grew up on that movie... still (to me) the best Superhero movie ever made. yeah this is terrible. i loved those movies as a kid. he was a great superman. I'm waiting for modernage's Superman collagatar. Haha, I was thinking the same thing when I logged in this morning.